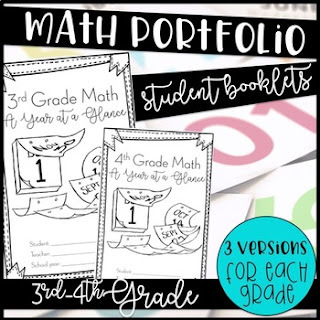 Let students showcase their learning over the course of a year with a math portfolio booklet. These booklets can be shown to students' parents during parent conferences and sent home as a documentation of student growth and progress over the course of the year. The booklets would also make excellent keepsakes for students, as they will be a picture of student growth. The portfolios could also follow the students and be given to their next year teacher, so the teacher can have the advantage of students' strengths and needs. There are THREE different versions for BOTH 3rd and 4th grade! -Graphs for students to record final grades or test grades for every standard. Check out these other third grade and fourth grade products!